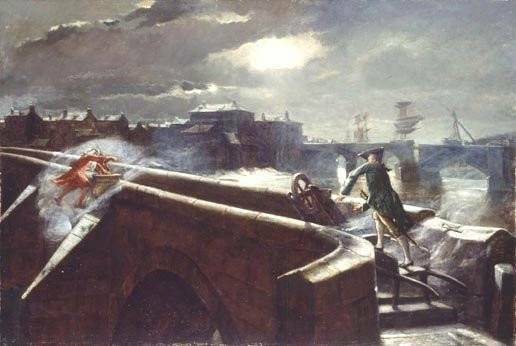 The quotation accompanying this painting is the first line of Robert Burns’ poem The Brigs of Ayr (1786), which refers to the contemporary replacement of the medieval bridge with a new one. The poem imagines the two bridges as ghosts, and their argument as a metaphor for and against progress. Compare wi’bonie brigs o’modern time? The painting is one of the most fanciful ever painted by Crowe, who was known for his realistic details and unsentimental straightforwardness. According to his diary entries, he was assisted in the perspective of the composition by his friend, the eminent French artist Jean-Léon Gérôme, who sent him tracings to work from. It was sold at Sotheby’s on 26 September 1930, was auctioned again in 1998 and 1999 (selling at auction at Stockholms Auktionsverk on 18 May 18 1999 for £21,000). It was formerly in the possession of the Peter Nahum at the Leicester Galleries in London, whose website includes a colour reproduction of the work, and an explanation of its meaning. It was purchased in 2001 by the South Ayrshire Museums service with assistance from the Edwards Bequest and the National Fund for Acquisitions, and is part of the collection at the Rozelle House and Maclaurin Art Gallery. A pencil sketch by Crowe, entitled Dial on centre of Auld Brig of Ayr, signed and dated December 19, 1892, is in existence and may have been the inspiration for the final painting. Size: 7 x 5 inches. It was offered on Ebay in February 2006 by Raye Dean Gilbert, Fine Art Dealers. It was offered again in June 2007 by a dealer from Houston, Texas.